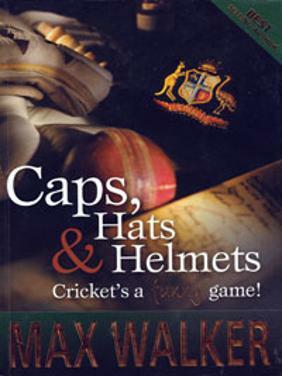 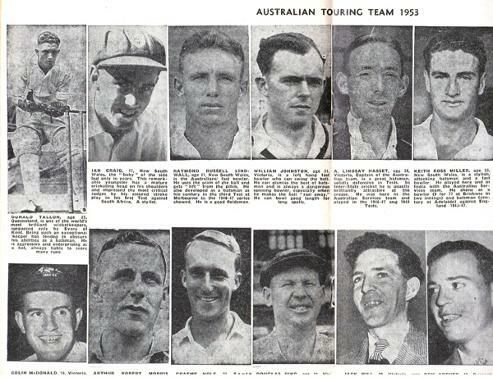 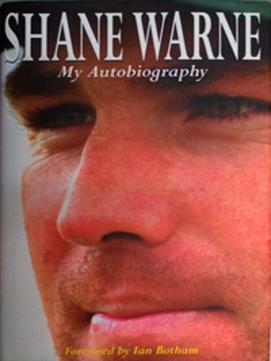 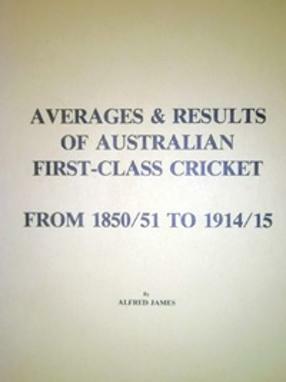 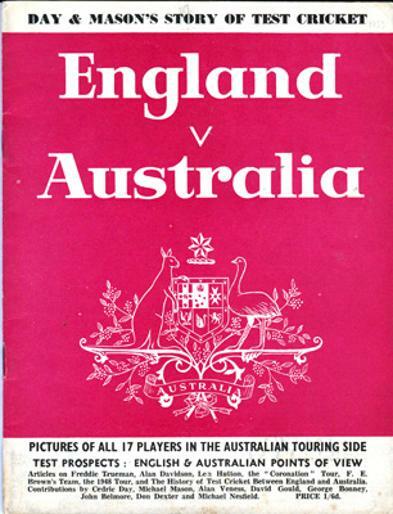 booklet featuring pictures of all 17 Australian Touring Party and articles & features. 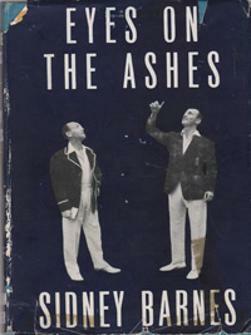 by former Aussie batsman Sidney Barnes. 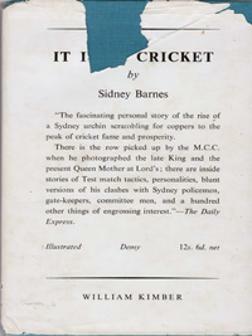 Original dust jacket has a few tears, etc. 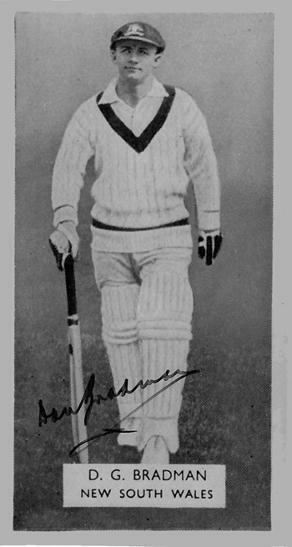 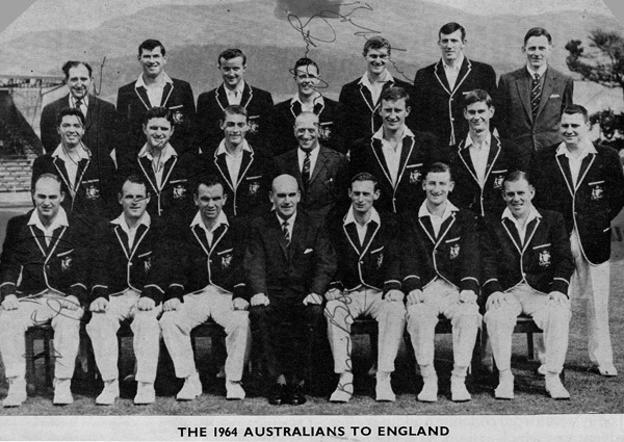 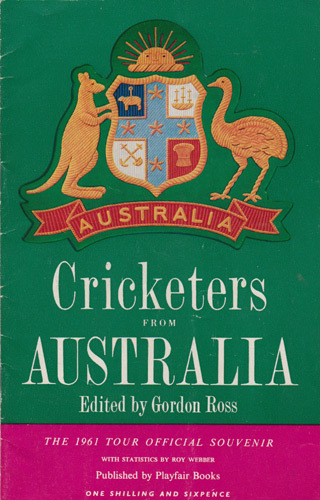 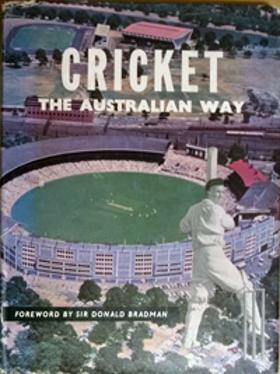 Pictures Fixtures & Personalities on the 1961 Ashes Tour of England featuring pen pics of the Aussie squad inc captain Richie Benaud, Neil Harvey, Bill Lawry, Graham McKenzie, Barry Jarman, Alan Davidson & Wally Grout. 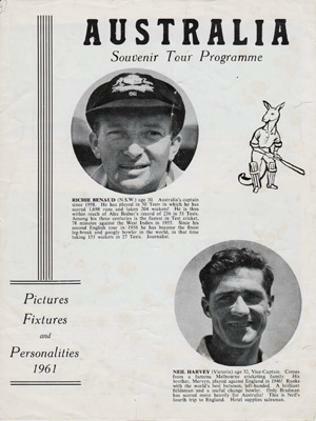 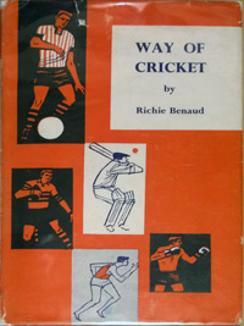 The 1961 Tour Official Souvenir Booklet by Playfair Books. 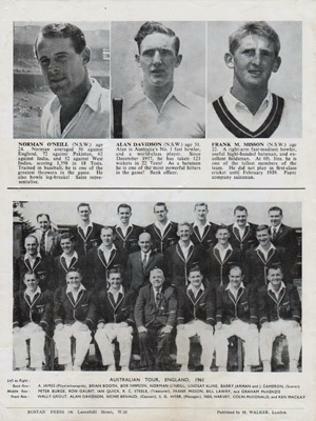 PETER BURGE, BRIAN BOOTH, REX SELLERS, TOM VEIVERS, JOHN MARTIN & BOB COWPER. 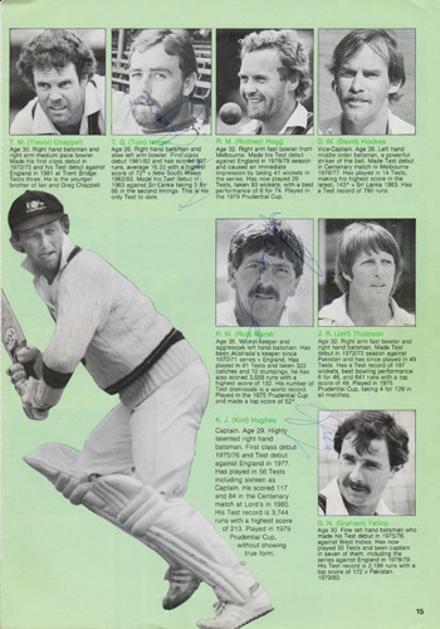 AUS: Bobby Simpson, Barry Jarman, Bill Lawry, Graham McKenzie, Ian Redpath & Neil Hawke. 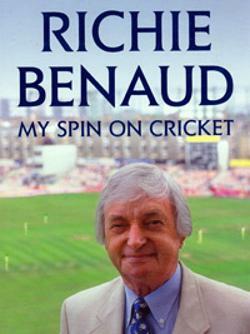 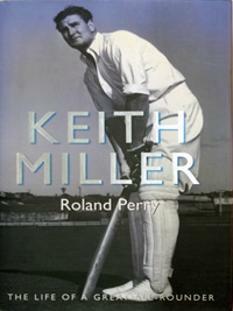 ENG: Ted Dexter, Colin Cowdrey, Geoff Boycott, Ken Barrington, Fred Trueman & Fred Titmus. 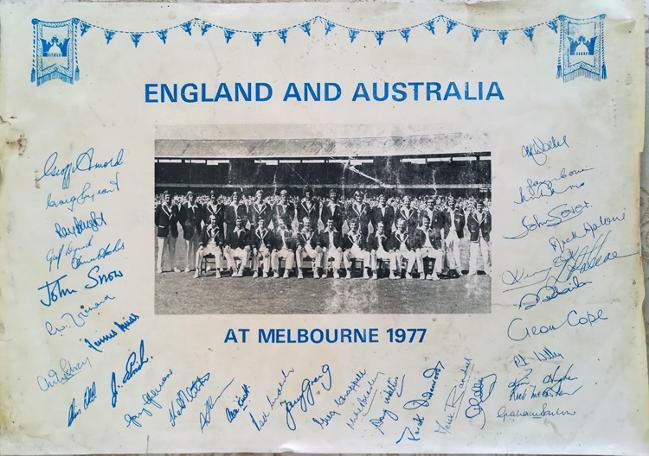 Centenary photo print of both England & Australia squads with facsimile autographs of all the players inc: Greg Chappell, Gary Gilmour, Rod Marsh, Doug Walters, Dennis Lillee, Mike Brearley, Tony Grieg, Geoffrey Boycott, Alan Knott, Derek Underwood, Bob Woolmer, Derek Randall, John Snow, John Edrich, etc. 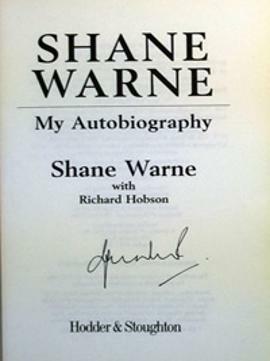 Print has some minor damage to the edges. 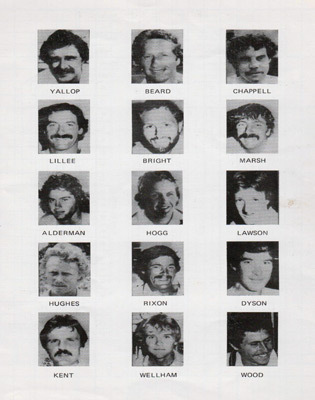 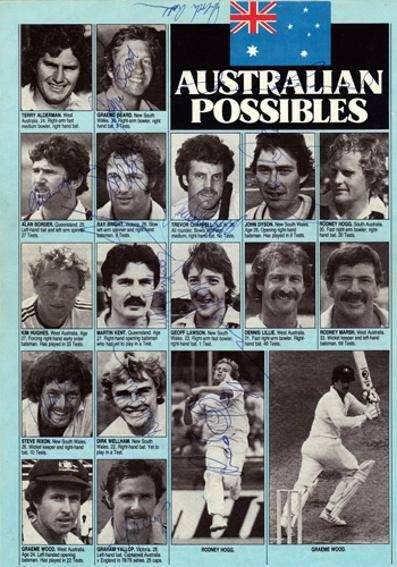 inc captain Kim Hughes, Dennis Lillee, Rod Marsh, Greg Chappell, Terry Alderman, Geoff Lawson & Rodney Hogg. 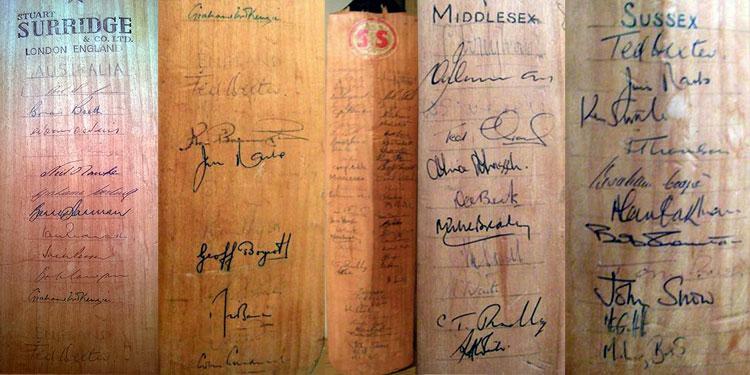 + 2 names currently unidentified. 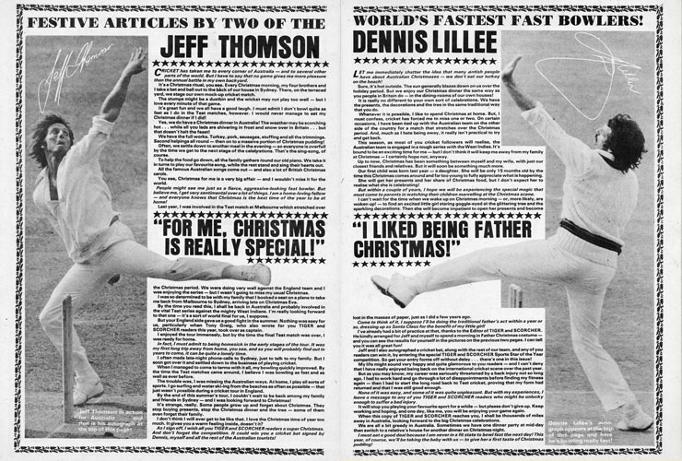 Magazine bio-pic double page spread. 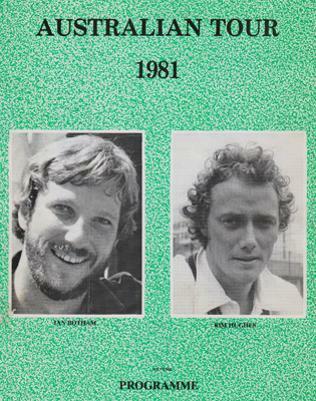 Graham Yallop, Ken MacLeay & Tom Hogan. 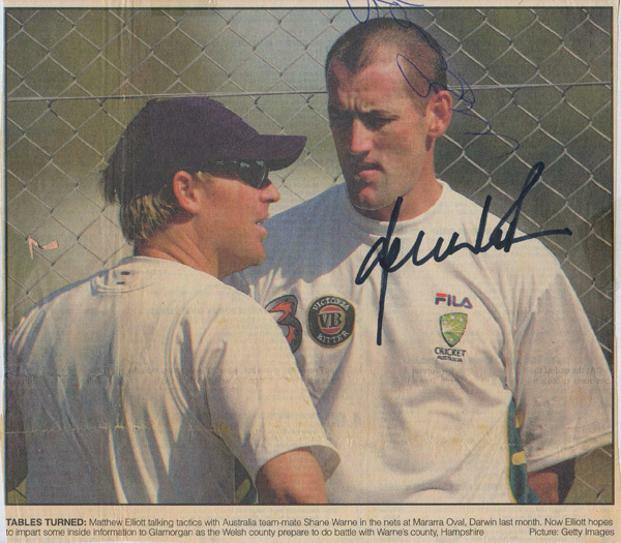 Magazine cut out article on players making the Ashes Tour signed by Brendon Julian, Matthew Hayden, Tim Zoehrer & TIm May. 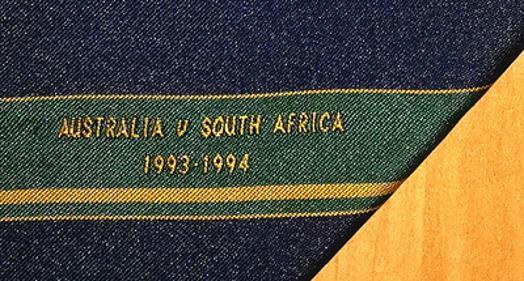 Official Neck Tie with Team logos. 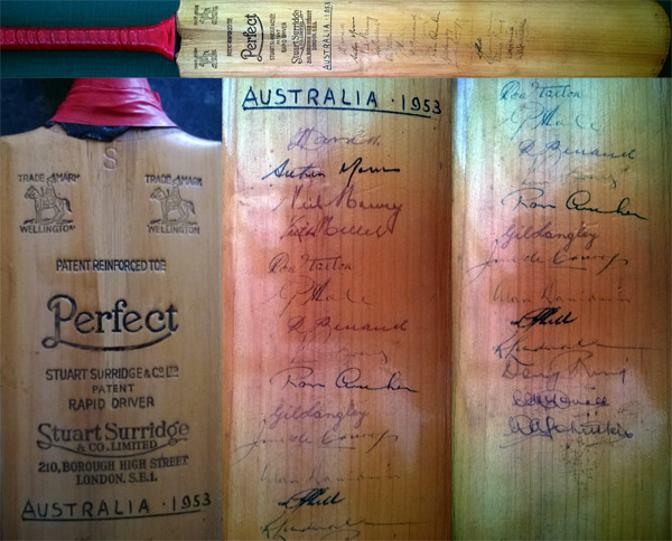 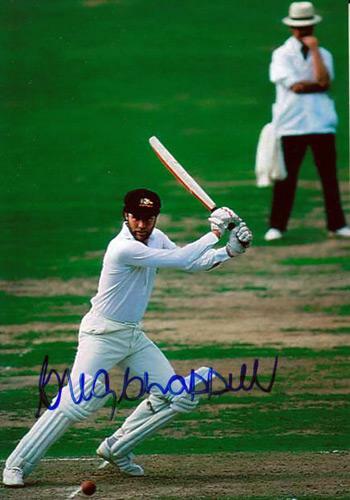 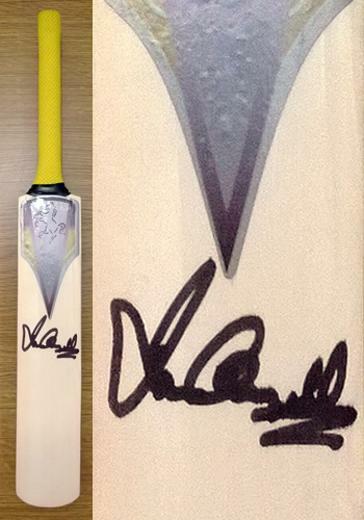 Also signed by fellow Aussie cricket captain Bobby Simpson. 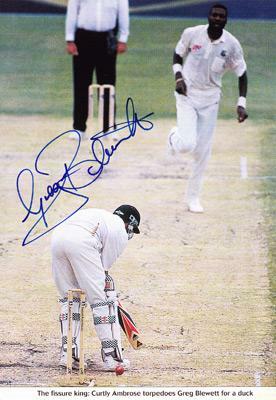 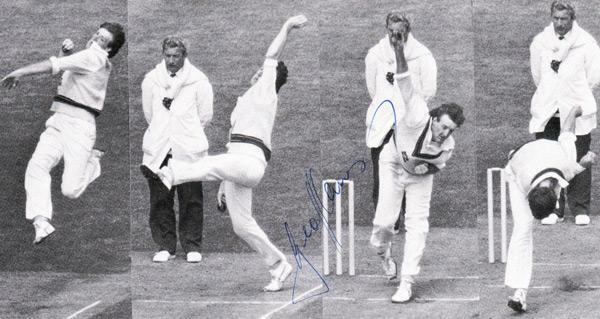 Autograph laid down in hardback book "Way of Cricket"
Signed colour magazine pic being clean bowled by Curtley Ambrose for a duck! 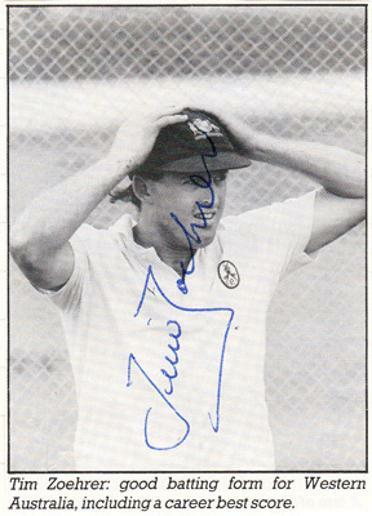 3 x autographed mini John Ireland print card, signed magazine photo & newspaper picture. 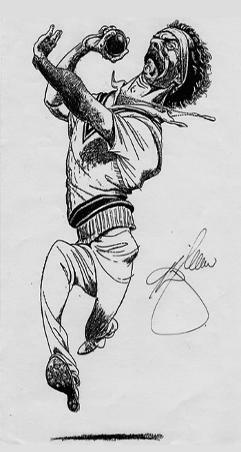 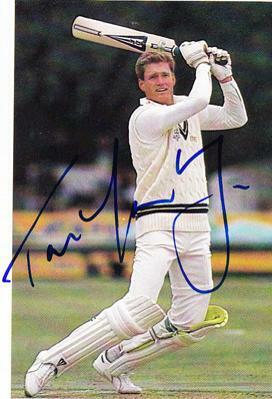 Signed B&W magazine batting pic. 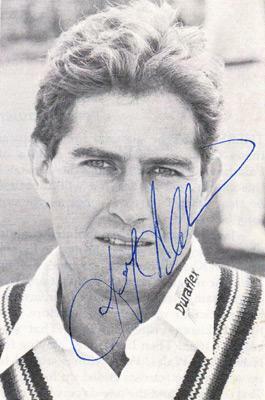 Signed Australia Ashes Test photo. 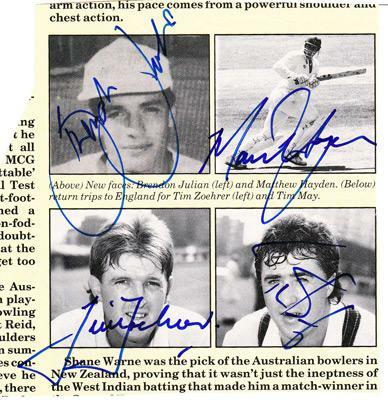 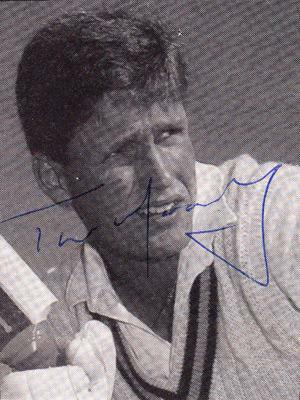 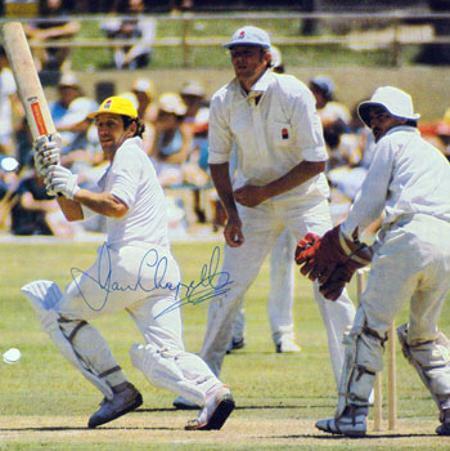 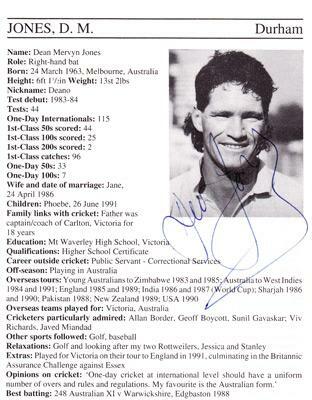 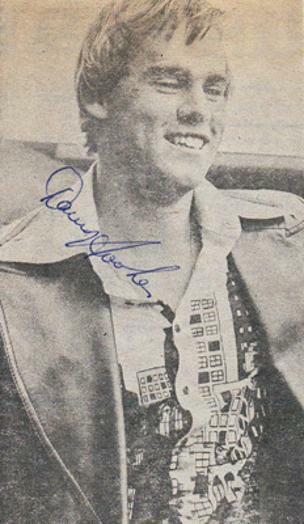 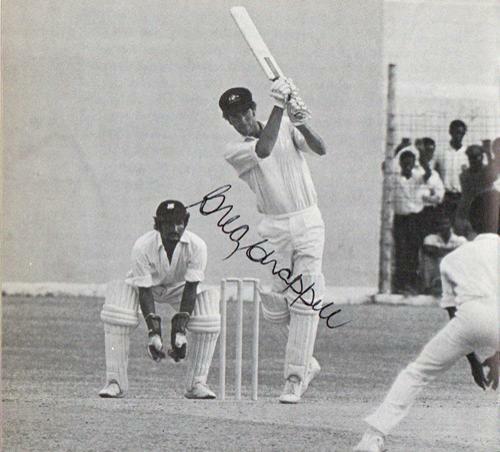 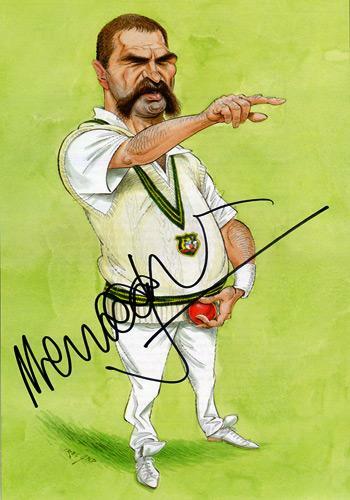 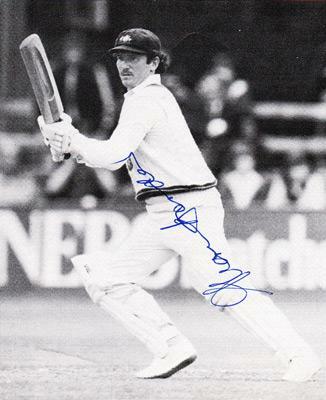 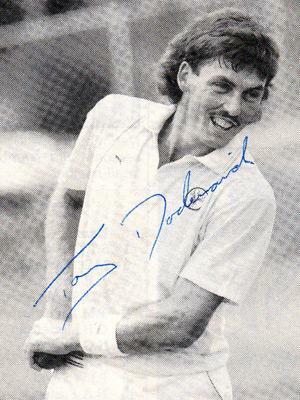 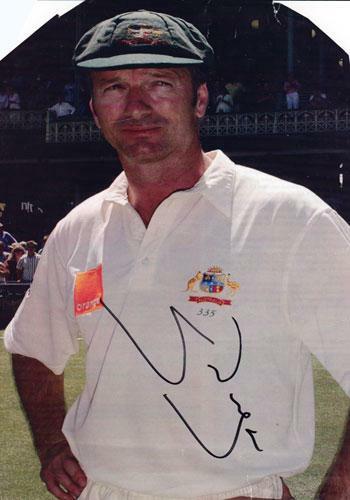 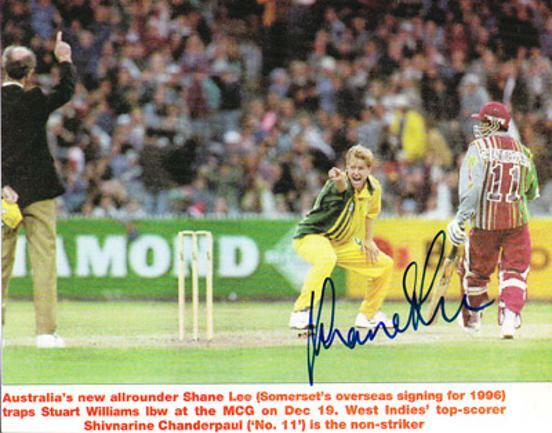 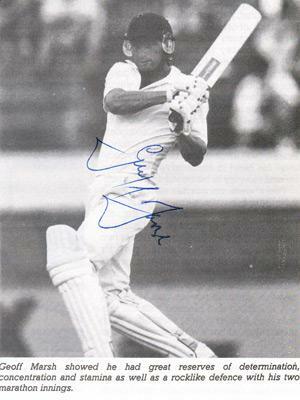 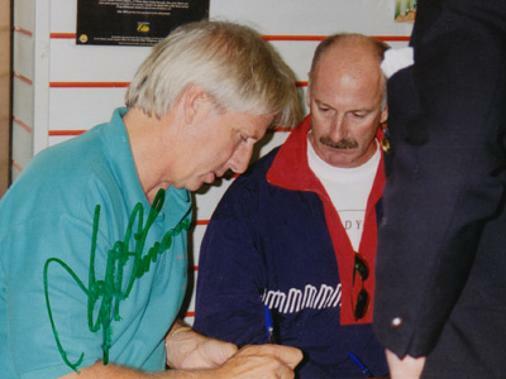 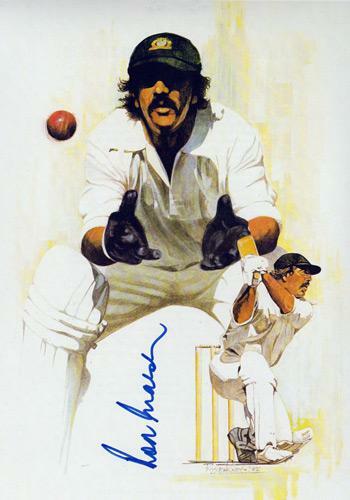 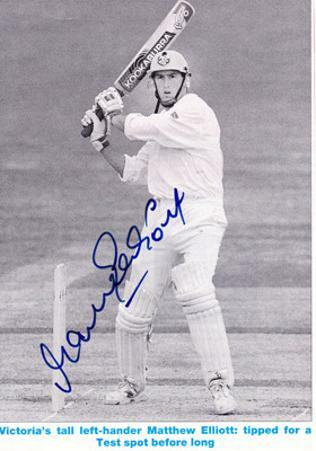 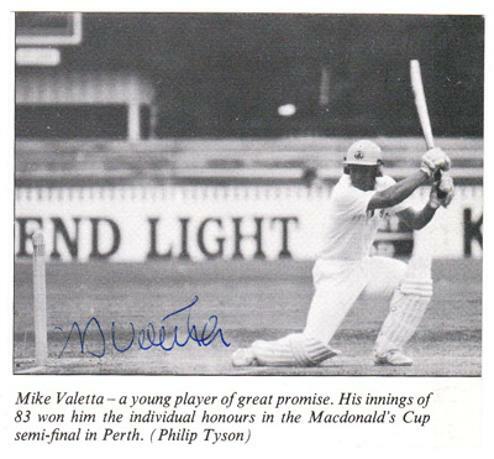 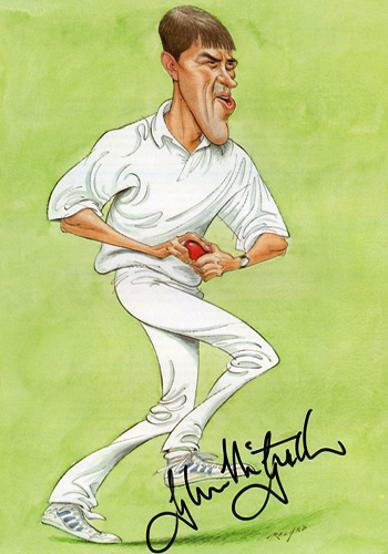 Signed Australia cricket magazine pic. 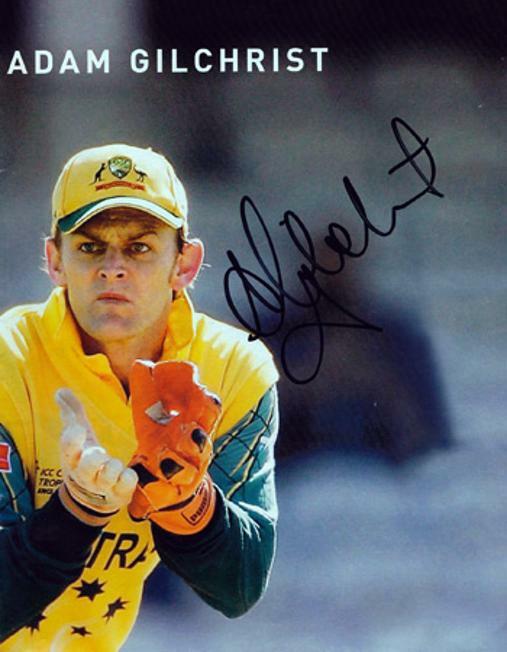 Signed Australian Ashes ODI photo. 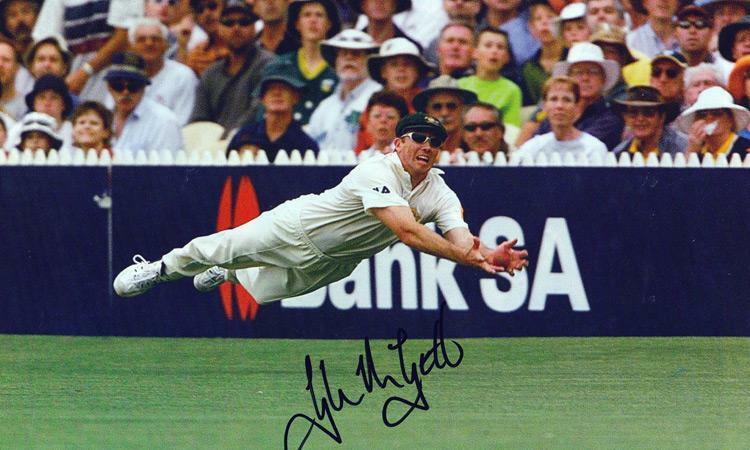 Signed "Run Out" A4 photo playing for Middlesex in 20/20 competition. 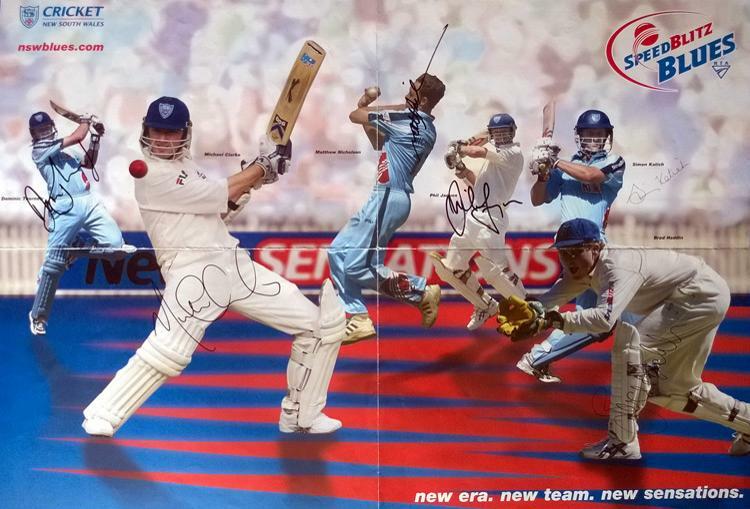 Signed Aussie ODI A3 wall poster. 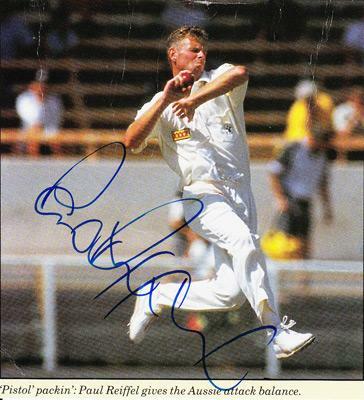 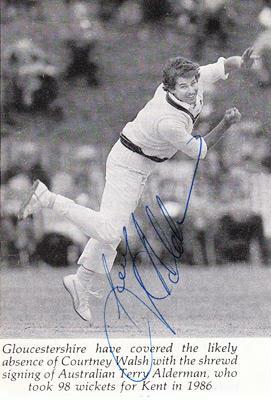 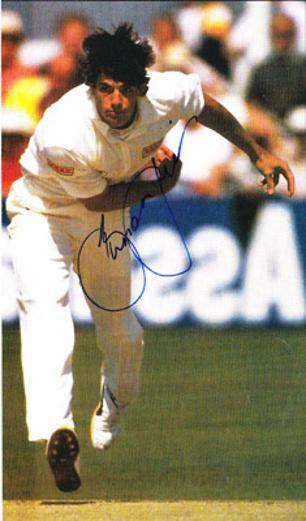 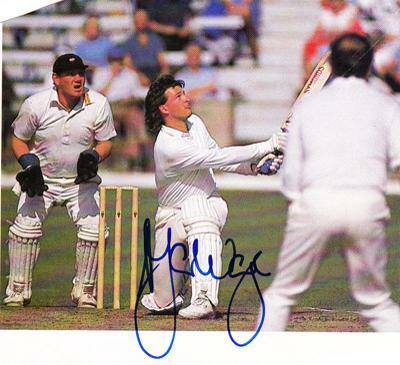 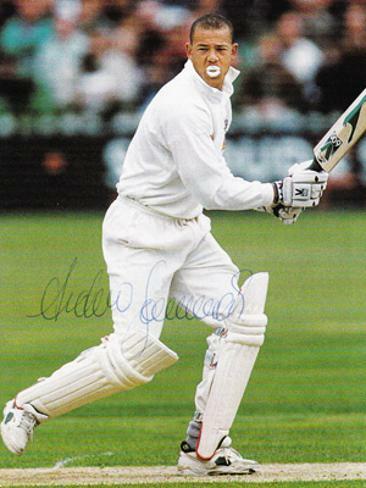 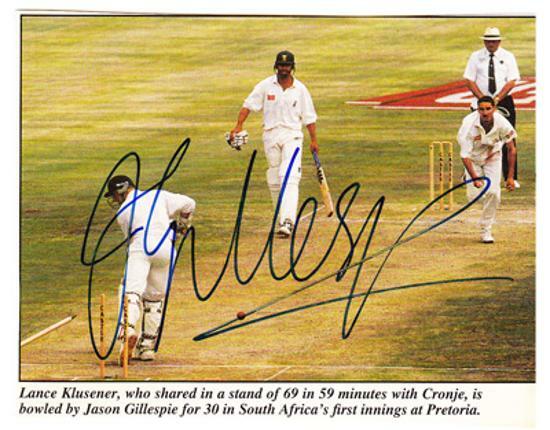 Signed magazine pic - clean bowling South Africa's Lance Klusener. 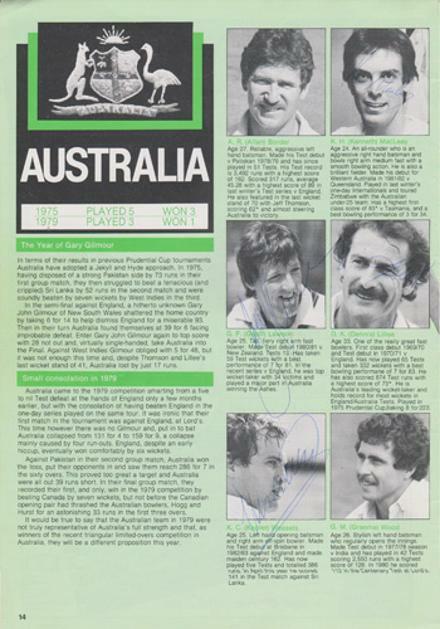 *Scrapbook cutting has fold across centre. 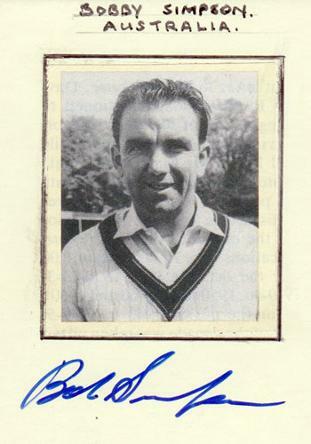 Signed John Ireland book picture plate. 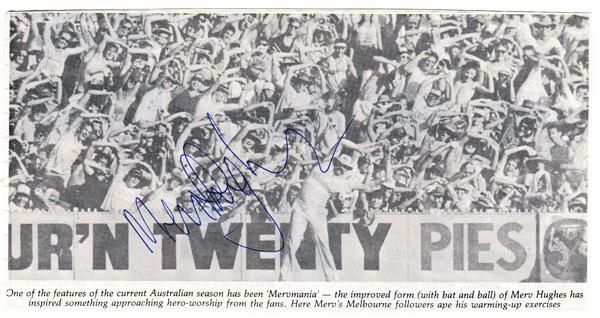 Signed B&W magazine pic of Merv doing his warms ups in front of the crowd who copy his movements. 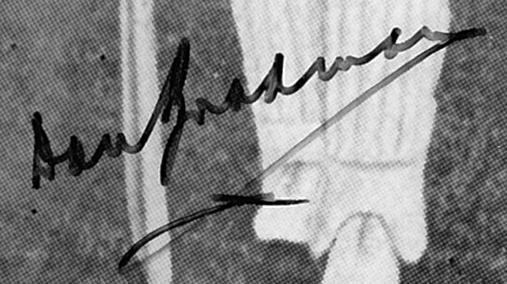 Signed Playfair Who's Who bio page. 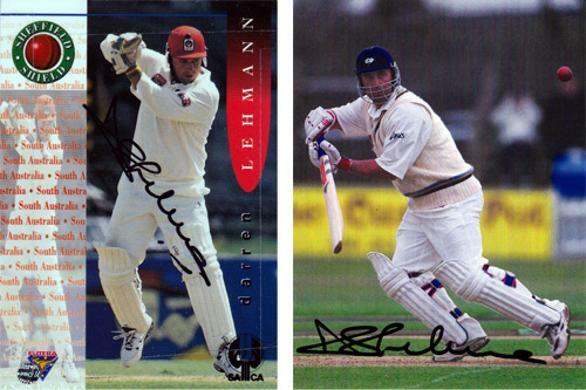 2 x signed magazine pics. 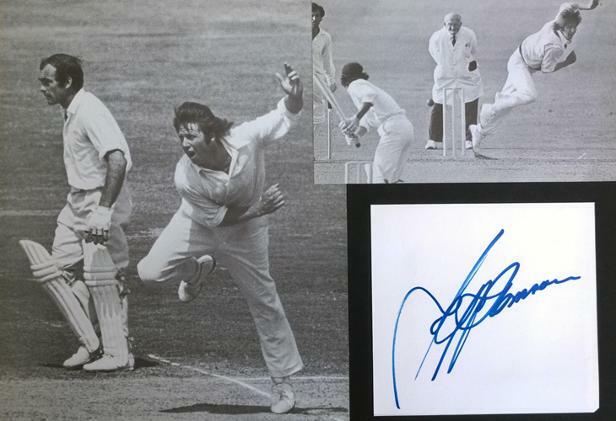 Signed B&W magazine bowling sequence pic. 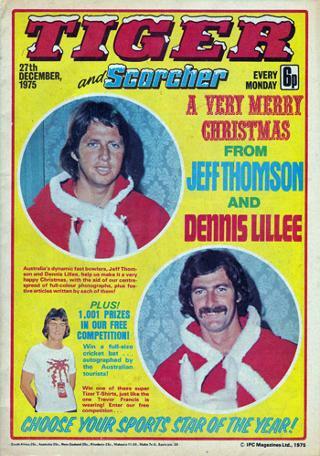 1975 Xmas edition of Tiger & Scorcher Comic Front cover + Inside articles on the fast bowlers & their Christmas Memories with facsimile autographs. 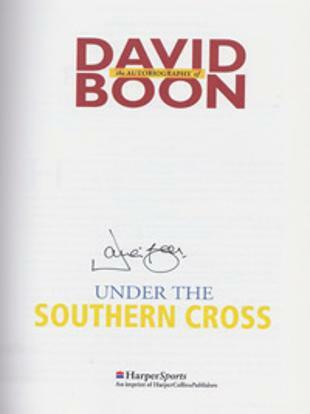 Signed A4 book page print. 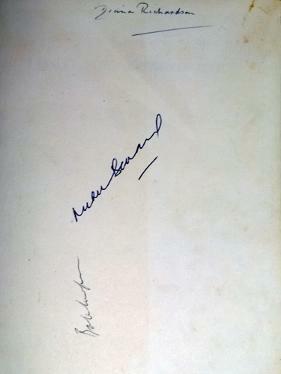 Signed John Ireland print book plate. 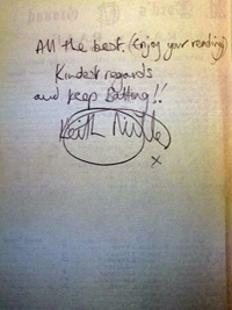 Miller has added a hand-written note: All the best (Enjoy your reading) Kindest Regards and Keep Batting!! 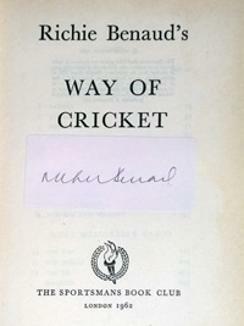 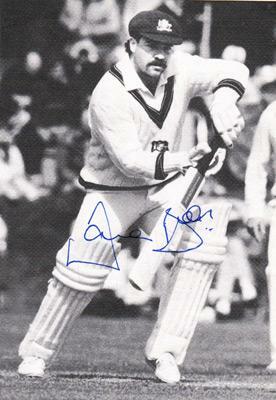 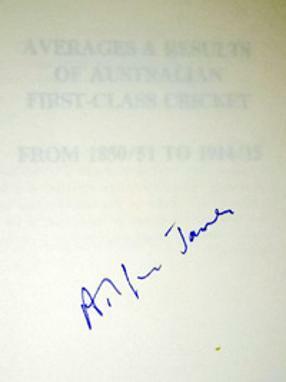 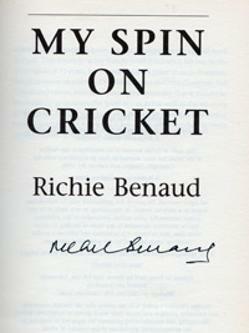 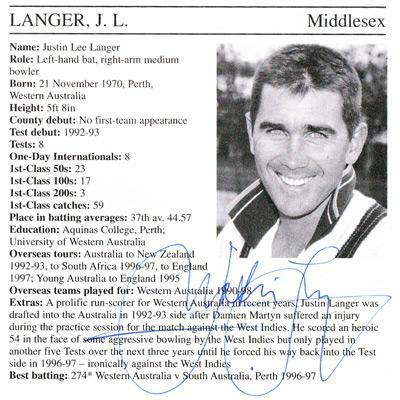 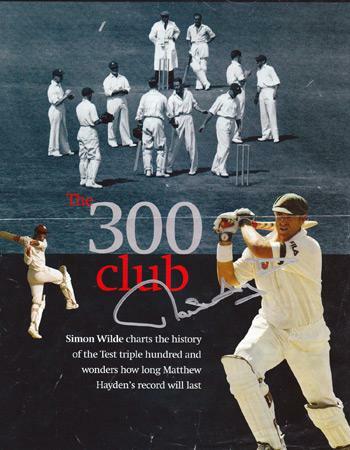 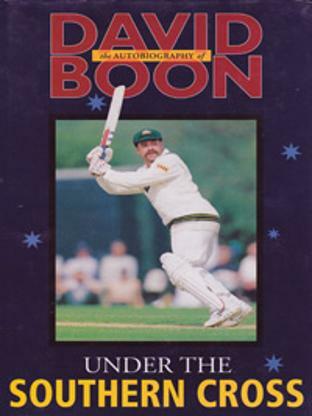 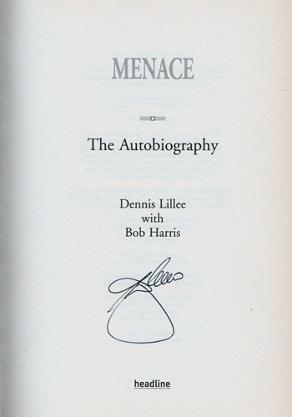 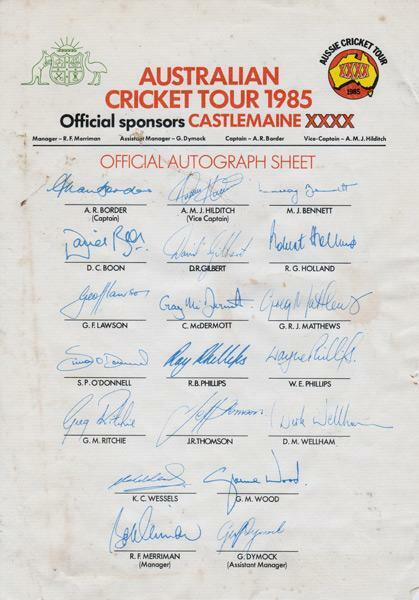 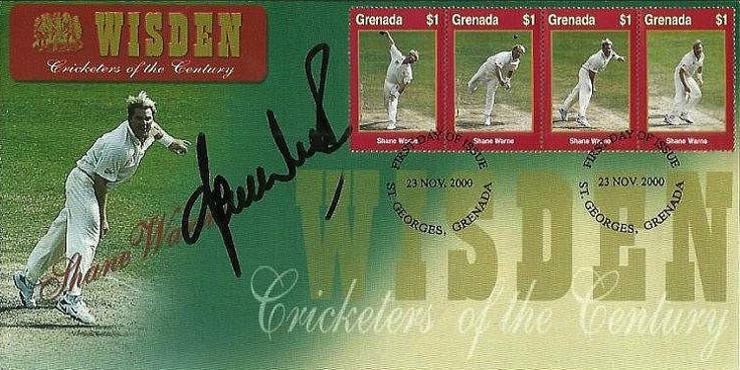 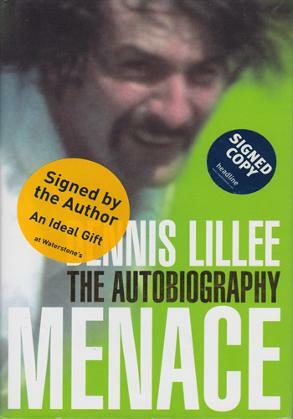 Autographed Lord's Taverners Book Page. 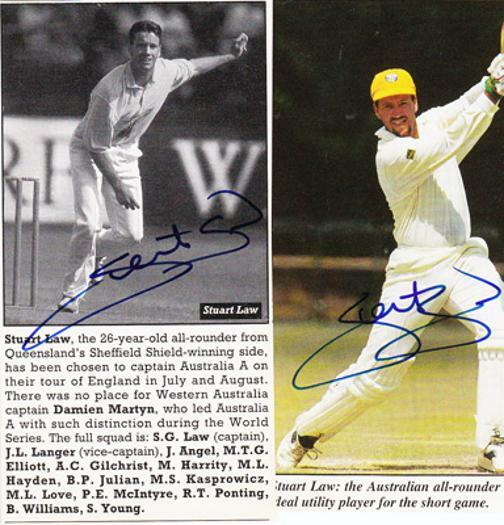 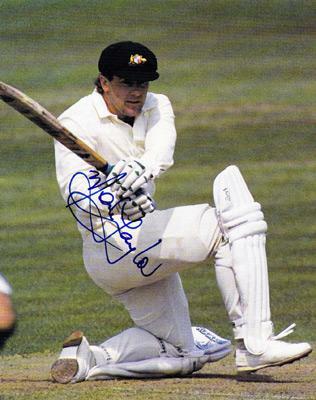 Also signed by Australian team-mate Matthew Elliott. 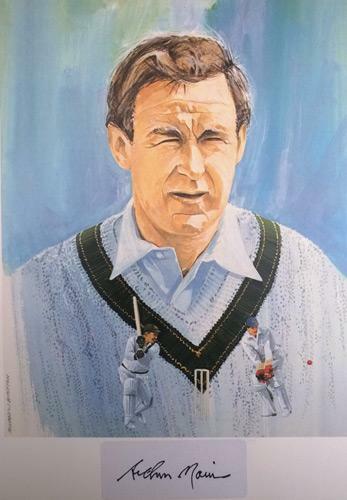 Approx size: 21 x 20 cms.